For other uses, see Elissa (disambiguation). Elissar Zakaria Khoury (Arabic: إليسار زكريا خوري‎; born October 27, 1972), commonly known as Elissa (إليسا), is a Lebanese singer who is one of Lebanon's most famous singers and one of the best known artists in the Arab world. In 2018, Elissa appeared as a judge on The Voice Ahla Sawt, the Middle Eastern edition of The Voice. Elissa was born in Deir el Ahmar to a Syrian mother and a Lebanese father. She has three brothers Ghassan, Kamil and Jihad and two sisters Norma and Rita. Elissa was raised in the Beqaa valley with her other siblings. She graduated from the Lebanese University with a degree in Political Science. Although she had a degree, her first love was not politics: it was the stage. Therefore, after graduating, she decided to pursue a professional career in show business and in music. To successfully combine her passion of politics and theater, Elissa joined Le Théâtre de Dix-Heures, a Lebanese Theatrical Group. Elissa's first studio album, Baddi Doub (I Want to Melt), was released by EMI Records in 1999. For the album’s hit single, she included a second language by teaming up with Spanish singer, Gerard Ferrer. In the same year, Elissa got her first big brand deal when shampoo brand Head & Shoulders took her on as the empowering and bold face of the company in the Middle East. Elissa released her second album, We Akhertha Maak, which included the duet, "Betghib Betrouh", sung with Lebanese Ragheb Alama. She was the only Arabic artist to perform in front of former United States President Bill Clinton at the Stars Charity show in Dubai. That year she won the Murex d'Or award for Best Female Artist. Her third studio album, Ayshalak (I live for you), was released in 2002. For the album’s hit single, she filmed a music video in Paris, dressed by Christian Dior. This was the first time Dior had worked with an Arabic artist. In 2002, Elissa inaugurated Kuwait's Virgin Megastore with Sir Richard Branson. Her clip, "Ajmal Ihsas" won an Arabic Music Award for Best Video Clip in Dubai. In 2003, Elissa signed a deal with Pepsi becoming the Middle East’s brand ambassador—a title she held for four years. Subsequently, she shot two advertisements with American pop star Christina Aguilera for Pepsi for the World Football Cup. Both advertisements were shot in Los Angeles. She collaborated with Irish singer Chris De Burgh in the duet, "Lebanese Nights." In 2004 she signed with the Saudi-owned Rotana, under which she released her fourth studio album, Ahla Donia, in May 2004. The album had many hits including "Kol Yom Fi Omry", "Irjaa Lilshowk", "Hobak Wajaa' (Inta Lameen)", and "Ahla Donia". Despite the huge success, Elissa revealed in an interview in 2017, she felt that this album was a step back from "Ayshalak", although it is a fan favorite. In 2005, Elissa became the first Lebanese singer to ever receive a World Music Awards for Best Selling Artist from the Middle East. The ceremony took place in Hollywood's Kodak Theater. In December 2005, Elissa received the Murex d'Or for Best Lebanese Artist and Best Video Clip for "Hobak Wajaa". In 2006, she released her fifth studio album Bastanak. The album had the hits "Bastanak" and "Law Taarafou" which received accompanying music videos, as well as "Kermalak, "Taa", "Fatet Sineen", and "Zanbi Ana". The latter was composed by Marwan Khoury. On November 15, 2006, Elissa received the World Music Awards for the second year in a row for the sales of Bastanak. Elissa's sixth and seventh albums were Ayami Beek (December 20, 2007) and Tesadaa Bemeen (December 26, 2009). The former included one of Elissa's biggest hits "Betmoun" as well as "Awakher El Shita", "Ayami Beek" and "Khod Balak Alaya". While the latter included another huge hit in "Aa Bali Habibi". Elissa received her third World Music Award for Tesadaa Bemeen. In November 2010, she was awarded the prize for Best Arab Female Artist in the Jordan Music Awards, and a few days later she received the Big Apple Music Award for Best Female Artist in the Middle East. Her eighth studio album, As'ad Wahda, was released in June 2012. During the summer of 2012, Elissa released the title song for the "Maa Sabk Al Esrar" series. In December 2012, Elissa was chosen to be one of the judges of The X Factor Arabia; It was on the air the first four months of 2013. On June 23, 2013 Elissa received two Murex D’or awards, for the Best Lebanese Singer and Best Arabic Song "Asaad Wahda". During the summer of 2014, Elissa released a song titled "Law" written by long term collaborator Marwan Khoury. Elissa released her ninth studio album Halet Hob in July 2014. The album included covers of the songs "Awel Marra" and "Helwa Ya Baladi". She released the first music video of "Hob Kol Hayati" on November 21, 2014. Elissa returned as a judge on The X Factor for its second season on March 14, 2015. Elissa released her cover version of "Mawtini" on April 29, 2015, along with its music video. The second video from her ninth studio album was released on May 14, 2015, for "Ya Merayti". Finally, she released "Halet Hob" as the final single in early 2016. The lyric video of "Halet Hob" has amassed more than 96 million views on YouTube. Elissa released her tenth studio album Saharna Ya Lail during the summer of 2016, which included lead single "Saharna Ya Lail". In May 2017, Elissa announced that she is the new face of Freshlook Air Optix Colors. During the summer of 2017, Elissa released a music video for the song "Aaks Elli Shayfenha" from the album Saharna Ya Lail. The aforementioned music video - directed by Angy Jammal - hit 3 million views during its first week of release and 7 million views after 2 weeks. In August 2017, Elissa was featured on Forbes Middle East English edition's August cover and gave a concert as part of Beirut Holidays Festival 2017. On August 14, Elissa released a remix for the song "Ana Majnouni" which was previously released 3 years ago. "Ana Majnouni" marked the third collaboration with her brother Camil Khoury and amassed more than half a million plays during its first 2 days of release. In early September, it was announced that Elissa will be one of the new The Voice season 4 coaches alongside Emirati singer Ahlam, Lebanese singer Assi El Hallani, and Egyptian singer Mohamed Hamaki. In July 2018, Elissa released the first lead single from her eleventh studio album titled "Ila Kol Elli Bihebbouni". On July 16, 2018, Elissa dropped a promotional single from the album entitled "Krahni". "Krahni" marked the fourth collaboration with her brother Camil Khoury who handled the song's arrangement. In addition to "Krahni", Camil has handled the arrangement for two more songs on the album: "Maridit Ehtimam" and "Enta W Maii". All three songs are in the Lebanese Arabic dialect. Elissa released her eleventh studio album Ila Kol Elli Bihebbouni on July 25, 2018. With 16 songs, the album includes trademark dramatic and orchestral tracks, such as "Al Mekhfi" by Lebanese composer Salim Assaf, "Lessa Fiha Kalam"–a dance hit with which Elissa continues her dance music journey, and "Wahashtouni" which is a cover of Warda's song of the same name. On August 7, 2018, Elissa released the music video for her song 'Ila Kol Elli Bihebbouni'. In the music video for 'Ila Kol Elli Bihebbouni', Elissa revealed how she privately diagnosed, battled, treated, and defeated early stage breast cancer. The music video went viral and amassed more than 9 million views during its first week of release and ends with the following message: "I've recovered, I've beaten the illness and I won... Early detection of breast cancer can save your life... Don't ignore it, face it... Do it not only for yourself, but for your loved ones." In August 2018, Elissa gave a concert as part of Beirut Holidays Festival 2018; among the attendees was Armenian entertainer Lubluba. She also gave a concert in Tunisia. In September 2018, the Lebanese Information Minister honored Elissa for her career. In October 2018, Elissa hinted at possible problems with Rotana Records due to the latter's exclusive new deal with the Paris-based music streaming service Deezer. In November 2018, Elissa tweeted that she had begun working on her upcoming twelfth studio album. On January 18, 2019, Elissa performed a benefit concert in Egypt. She will released the music video for her song "Krahni" on 17 April 2019. In 2014, Elissa took to social media to condemn the atrocities committed by ISIS against minorities, stating "I'm Lebanese and I'm proudly Christian, shame on such people." Elissa is an outspoken advocate of women’s rights. Elissa is also an advocate for breast cancer awareness as she has privately battled and defeated early stage breast cancer. She had kept it a secret from both the press and public from its discovery on December 26, 2017, until the moment of her 'Ila Kol Elli Bihebbouni' video release during the summer of 2018. The news about Elissa having battled breast cancer caused a shock and broke the taboo. There was a massive outpouring of support for the artist and thousands of people shared #Elissa (اليسا#) and #To_All_Who_Love_Me (الى_كل_اللي_بيحبوني#), causing the hashtags to trend in Lebanon and in the Middle East. The shock, however, encouraged women to go get checked. She is strong woman mentally as she admitted in May Chidiac Foundation conference that she was subject of bullying for her mouth on Social Media, but she said, "When you achieve what I achieved in life, you can come and say whatever you want." She is one of the biggest supporters of Lebanese Forces party and its leader Samir Geagea as she backed him for presidency before the election of Michel Aoun. ^ "FARFESH.COM - تسريب جواز سفر اليسا على الـ". Retrieved August 5, 2016. ^ a b nadiadhahir (August 22, 2017). "إليسا.. السر وراء لقب "ملكة الإحساس" - Forbes Middle East". ^ a b c d e "Women Are Saying They're Getting Checked After A Famous Lebanese Singer Said She'd Had Breast Cancer". ^ Press, ZEINA KARAM Associated. "Lebanese diva breaks taboo with clip announcing cancer fight". ^ a b c d e f g Khazaal, Chaker (March 13, 2015). "Elissa: A Light in the Dark Times of the Middle East". ^ a b c d e f g h i j k l nadia-3 (August 20, 2017). "The Secret To The Success Of Elissa Lies In More Than A Love Song". ^ "From rags to riches: Arab celebrities’ net worths revealed"
^ a b "Lebanese Information Minister to honor Elissa for her career". EgyptToday. ^ a b "'Stop the war': Elissa urges fans to pray for Syria". April 5, 2017. ^ ElissaVEVO (June 21, 2009). "Elissa - Baddy Doub" – via YouTube. ^ Elissa (May 3, 2012). "Elissa - Ayshalak (Official Clip) / إليسا - عايشالك" – via YouTube. ^ Elissa (August 3, 2012). "Elissa - Maa Sabk Al Esrar (Audio) / اليسا - مع سبق الإصرار" – via YouTube. ^ Elissa (August 22, 2014). "Elissa - Law (Long version) / اليسا - لو" – via YouTube. ^ Rotana (July 25, 2014). "Halet Hob ... Elissa - Lyrics - حالة حب ... إليسا - كلمات" – via YouTube. ^ Rotana (July 19, 2017). 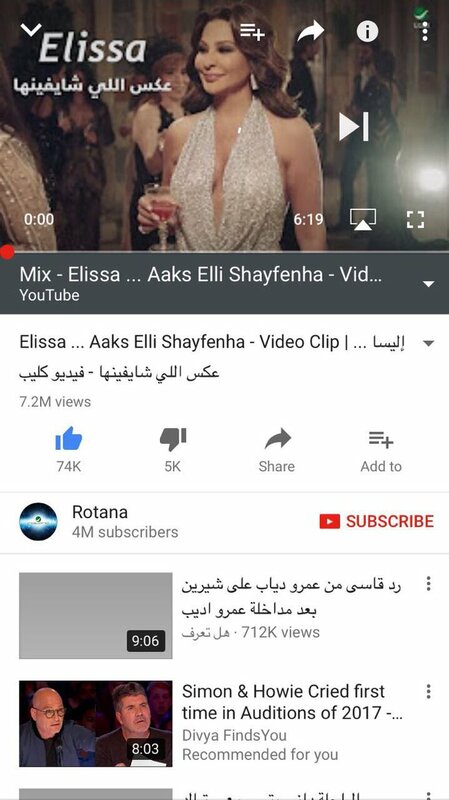 "Elissa ... Aaks Elli Shayfenha - Video Clip - إليسا ... عكس اللي شايفينها - فيديو كليب" – via YouTube. ^ ""عكس اللي شايفينها" لـ إليسا إختيار موفّق أنجي جمّال". ^ "WATCH: Elissa music video hits 3 million views in first week". July 24, 2017. ^ Bechara Maroun (August 3, 2017). "Elissa - Wahashtouni HD وحشتوني - اليسا Beirut Holidays 2017" – via YouTube. ^ "Elissa - Ana Majnouni (By Camil Khoury) - Play for free on Anghami". August 14, 2017. ^ ""مجنونة" اليسا في الصدارة مجددّاً". August 29, 2017. ^ "تعاون أخوي بين كميل وإليسا والنتيجة "الصدارة" – 7asriyan". www.7asriyan.com. ^ "MBC announces newest 'The Voice' coaches - Egypt Independent". September 7, 2017. ^ "Elissa and Essi: Here are the New Judges on The Voice!". September 6, 2017. ^ "Elissa - Ila Kol Elli Bihebbouni - Play for free on Anghami". July 11, 2018. ^ "Review: 'Ila Kol Elli Bihebbouni', Elissa Drops First Song From New Album And It Is Growing on Us". July 12, 2018. ^ "Elissa 2018 - Play for free on Anghami". Anghami. ^ "Text Your Ex This Song! Elissa Just Dropped Second Track From Upcoming Album, Entitled 'Krahni'". July 18, 2018. ^ "Elissa ... Krahni - 2018 | إليسا ... كرهني - بالكلمات". YouTube. Retrieved 2018-08-01. ^ "Elissa - Enta W Maii - Play for free on Anghami". July 24, 2018. ^ "Elissa's new album shows the cracks behind the image". ^ "16 أغنية جديدة في ألبوم إليسا 'إلى كل اللي بيحبوني'". البوابة نيوز. ^ "Elissa ... Lessa Fiha Kalam - 2018 | إليسا ... لسه فيها كلام - بالكلمات". YouTube. Retrieved 2018-08-01. ^ Rotana (July 24, 2018). "Elissa ... Wahashtouni - 2018 - إليسا ... وحشتوني - بالكلمات" – via YouTube. ^ a b Rotana (August 7, 2018). "Elissa ... Ila Kol Elli Bihebbouni - Video Clip 2018 - إليسا ... إلى كل اللي بيحبوني - فيديو كليب" – via YouTube. ^ a b "Lebanese pop sensation Elissa reveals breast cancer battle in music video". August 13, 2018. ^ a b c "How Lebanese sensation Elissa defeated cancer - Annahar Staff". August 8, 2018. ^ لوك لوك (August 10, 2018). "اليسا تعلق على مرضها بالسرطان فى اول ظهور لها بعد مرض السرطان فى حفلة اليسا اعياد بيروت 2018" – via YouTube. ^ "إليسا: سعيدة بزيارة تونس يوم إعلان المساواة بين الرجل والمرأة في الميراث — النهار أونلاين". August 14, 2018. ^ "عاجل - اليسا على وشك الانفصال عن"روتانا" بسبب ضياع ارشيفها: "انا مدمرة"". Laha Magazine. October 11, 2018. ^ "Lebanese star Elissa has not been deleted from the internet". The National. ^ "Elissa to perform in Egypt on Jan.18". EgyptToday. ^ "Elissa to perform cancer-benefit concert in Egypt on January 18". Sada El Balad. ^ "الوليد بن طلال يعلن رسميًا: 40% من أسهم روتانا لصالح إليسا". January 23, 2019. ^ "Elissa continues to combat breast cancer". EgyptToday. ^ "Cancer survivor Elissa tweets in support of Lebanese beauty runner-up". english.alarabiya.net. ^ Editor, Sara Al Shurafa, Web News (August 7, 2018). "Lebanese singer Elissa announces she has fought breast cancer through new video". ^ "After Elissa, fans of Myriam Fares shocked at 'cancer' rumors". english.alarabiya.net. ^ "Lebanese Diva Breaks Taboo With Clip Announcing Cancer Fight". ^ "Gaby -SAVER on Twitter". ^ "Elissa chosen as ambassador for breast cancer awareness campaign". EgyptToday. ^ "Elissa visits Maarab in show of support for Geagea - News , Lebanon News - THE DAILY STAR". www.dailystar.com.lb. This page was last edited on 16 April 2019, at 02:12 (UTC).